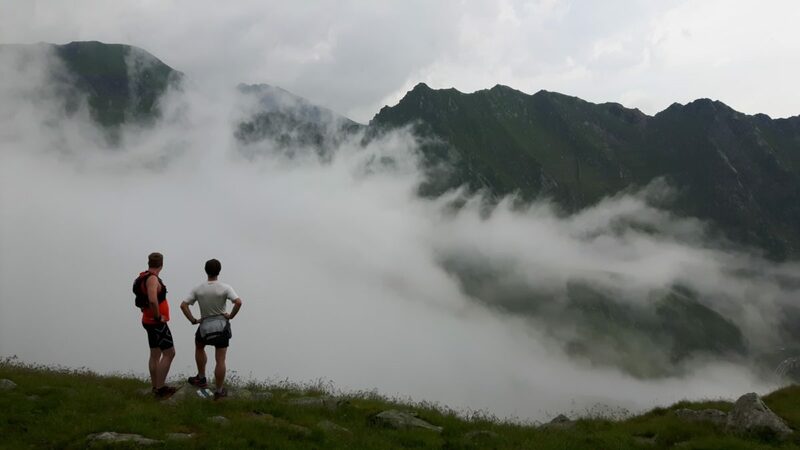 Ominous weather didn’t stop Giles Story, Aidan de Gruchy and Joe Williams from hitting the mountain trails of Romania’s Făgăraş chain, a tremendous ridge in the Southern Carpathians. Giles Story tells of the weekend’s adventures in Count Dracula’s homeland. The storm closed in with remarkable swiftness. A mere twenty minutes earlier we had been running along a high spur, our first foray on foot in these mountains, amid gently rolling evening cloud. Now all that could be seen beyond the wooden veranda of the hut was dense fog backlit by flashes of lightning, with thunder so hard on its heels that the centre of the tumult could only have been a few hundred metres away. The rain pounded down, making its own contribution to the din. We all three had the same thought, something along the lines of ‘wow, that came in quickly, and I’m glad we’re not on the top of the ridge right now’. Instead we enjoyed the wonderful feeling of security that derives from being in a modern building when the weather is terrible outside. We’d left London at three o’clock the same morning, to catch an early flight to Bucharest. 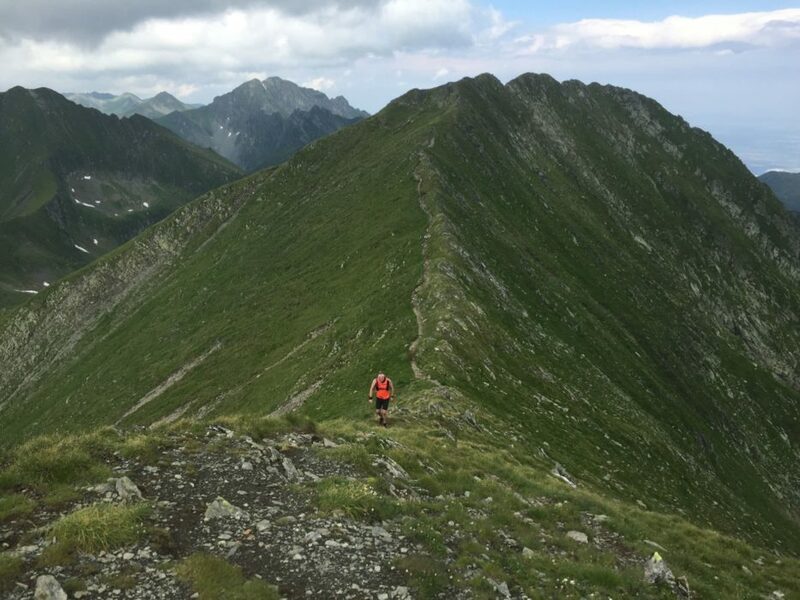 Joe Williams, a long-time friend, experienced mountaineer and ultramarathon runner, sparked the idea for the trip – a long-weekend in mid-July exploring fast and light in the mountains of Romania. I had been musing on a journey to Transylvania since reading Bram Stoker’s Dracula the preceding Christmas, so took little persuading to join. 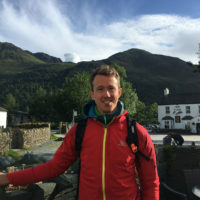 In a short time we were three, with Aidan, another ultramarathoner whom I had enjoyed getting to know while supporting Joe for his Bob Graham round last summer, also in on the adventure. 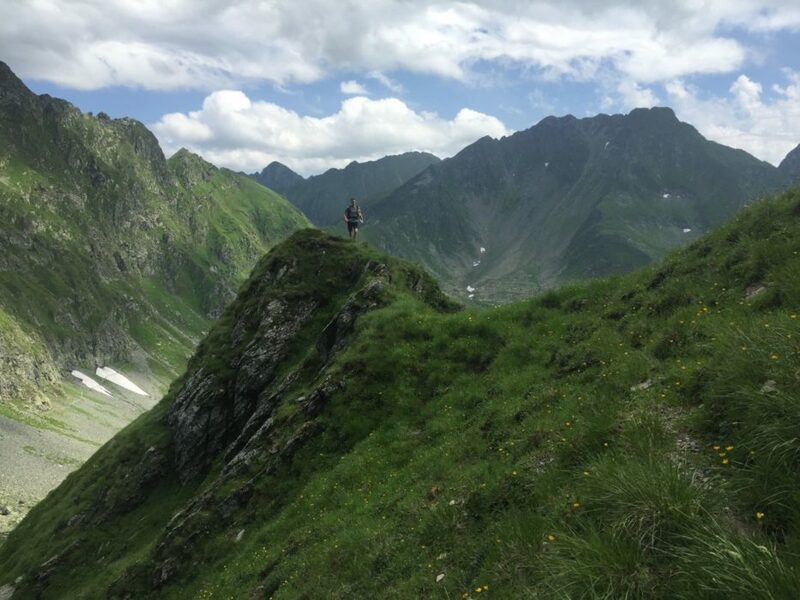 We had sketched out a three-day hut-to-hut itinerary along the Făgăraş chain, a tremendous ridge of the Southern Carpathians, which runs east to west for some 50 miles, and is home to Romania’s highest peak, Vârful Moldoveanu. A few days before our departure, Joe had messaged to say, ‘Jeez guys, you seen the weather for Braşov? Pretty terrible…’ The forecast showed torrential rain and thunderstorms for our earmarked four days. Suddenly a multi-day route on a high exposed ridge the best part of a day’s walk from civilisation seemed ill advised. So it was that on the flight we buried ourselves in maps and studied the descriptions in James Roberts’ Cicerone guide, The Mountains of Romania, hatching a revised plan to drive to Bâlea Lac atop the Transfăgăraşan highway, and base ourselves there. We would keep our options open and check the forecast daily. The aforementioned road, built under former President Nicolae Ceauşescu, traces a tantalisingly sinuous red line on the map, bisecting the main ridgeline. We approached from the south, Joe at the wheel, amid gathering cloud. The weather down on the plains outside Bucharest had been warm and sunny, the big skies over fields of wheat and maize evocative of America’s Midwest. The landscape gradually became more pastoral, with misty meadows amid rolling hills sheltered by broadleaved woodland; we passed horse drawn carts loaded with timber, atop which sat groups of dark-haired young men with weather-beaten faces, kyphotic old women carrying baskets of sticks on their backs, and tall, conical hayricks in the fields alongside. The fields were probably still mown with a scythe, I remarked. Gradually the hills became more densely wooded, deciduous trees giving way to conifers as the road climbed into the mountains. We were struck by how unspoiled and seemingly ancient the forest appeared, and drew analogies with North America. To distract Joe from the relentless hairpins I read aloud a passage from Patrick Leigh Fermor’s Between the Woods and the Water (the second of three volumes documenting his epic journey from Rotterdam to Istanbul in the 1930s), which explained how the Romanians claim their roots in the Roman conquest of the Dacian kingdom in the second century AD. We paused briefly at a vertigo-inducing concrete dam at the head of Lacul Vidraru, before the road continued up to the watershed. In the final few kilometres the forest thinned and the trees ceded first to scrub and then to grass. Just above the treeline, we acquired some smoked sausage and cheese from a convenient roadside stall. The stall owner gave us each a fiery capful of Pálinka – homemade moonshine – from a large plastic bottle but couldn’t persuade us to buy a litre of the stuff. Lac Bâlea, at the road pass, turned out to be something of a honeypot. Following a hurried price-comparison between the two lakeside cabanas (‘cabana’ is the Romanian refuge) we opted for the Cabana Paltinu. After reading up about the Făgăraşan cabanas, which were described in one report as being like high Alpine refuges were a hundred years ago, this was a disappointingly luxurious establishment! Setting out for our evening jaunt onto the ridge, we attracted some dispassionate glances from two strongly built men in military pants, who looked every bit like the henchmen of a Bond villain. 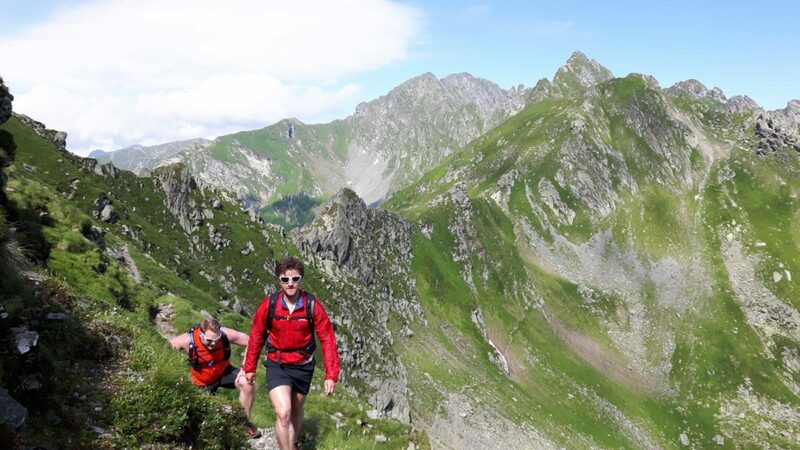 We gained height, up a narrow trail towards Şaua Netedului (‘şaua’ is the Romanian for ‘col’ or ‘saddle’), excited to be exploring an entirely new mountain range for the first time. 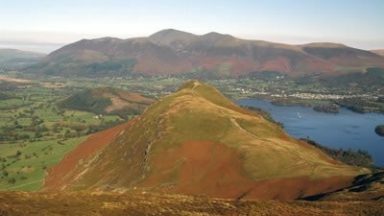 Points of comparison to other places abounded; the misty greenery could feel homely to anyone familiar with the English Lake District for example, but these mountains possessed a grandeur that dwarfed anything in the British Isles. 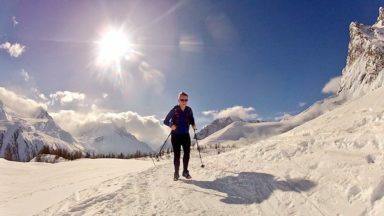 The closest approximation we could come up with was a mixture between Scotland and the Alps. From the summit of Netedu, a 2351m protuberance on the Buteanu ridge, we looked eastwards across the northward spurs descending from the main Făgăraş chain. The arêtes were arrayed in overlapping splendour as far as the eye could see, with cloud rolling up from the plains and filling the deep valleys between them. The aforementioned storm that came hot on our heels lasted the whole night. However we awoke to a blue sky, punctuated only by the odd cumulus. After a solid breakfast of standard central European fayre, we embarked on an out-and-back mission eastwards along the main Făgăraş ridge. The trails were well marked, with various coloured symbols, either painted on the rock, or in less-remote spots atop bus-stop style posts. We climbed gently but steadily, discussing plans for a flat marathon in the spring, up a well-trodden blue triangle route, which led us to the Şaua Caprei. From the grassy saddle a rutted path, swept down to Lac Capra, a small tarn that glistened in the morning sun. Memorials to fallen climbers were to be a frequent feature along the ridge, and here a white marble obelisk commemorates four Romanian Alpine climbers killed in an avalanche. After rounding a grassy southward spur, we saw our traverse path laid out ahead, in the curve of a gentle cirque, with the tiny painted tin roof of the Salvamont shelter (Ref. Fereastra) two kilometres in the distance. We crossed a couple of medium-sized snow patches, quite a surprise in the height of summer on these south-facing slopes. The contours on our map were spaced 100m apart, making for a few deceptively large ups and downs along the way, and after one of these surprise climbs we attained Fereastra Zmeilor (‘Dragon’s Window’), featuring a short scrambly section with chains bolted to the rock. 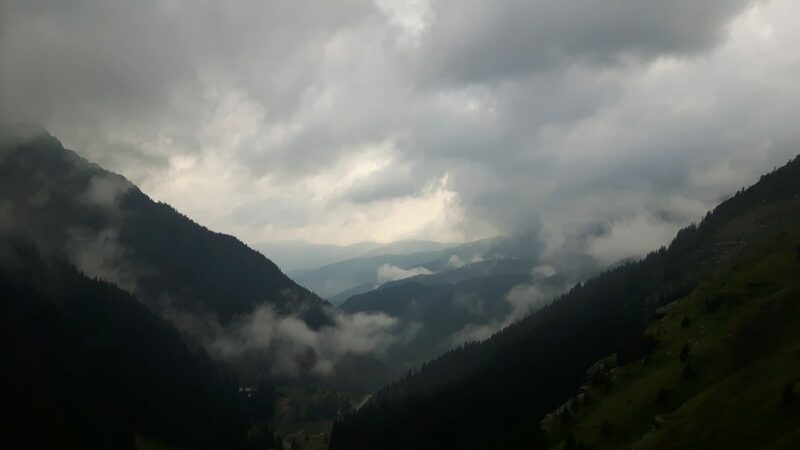 The path then turned briefly to the north side of the ridge, with spectacular views down the wooded valleys to the vast plain of the Făgăraş Depression beyond. We passed a party of Romanian walkers, and congratulated them on their wonderful mountains before regaining the main crest of the ridge along another textbook section of grassy arête. 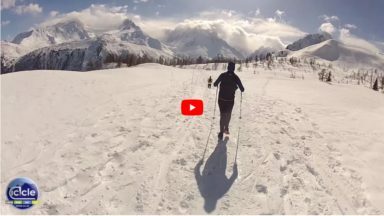 Joe did a spot of ‘sky-running’, nimbly dancing along the very knife-edge, while Aidan and I for the most part let our sense of self-preservation get the better of us. A little further along the temperature seemed to fall slightly, and banks of cumulus began to roll in from the south. We were suddenly reminded of both the shaky forecast and of how quickly the weather had closed in the evening before. After an assessment of timings we opted to make the next peak, Vârful Mircii (2461m), the zenith of the day. The peaks beyond, Moldoveanu included, beckoned temptingly, but would have to wait for another trip. As we retraced our steps the weather seemed to hold off, affording us a chance to loiter a little on the traverse path, where we watched a flock of sheep lined up in formation on the hillside like a coiled rope, and recalled a warning at the front of the Roberts’ Cicerone guide about Carpathian sheepdogs: ‘The breed is called Ciobănesc de Munte (‘Mountain Shepherd Dog’)… above all, abandon all your soft western impressions – in a little-walked-over stretch of mountains a pack of uncontrolled Carpathian sheepdogs away from the shepherd will normally unhesitatingly try and kill you – they know how and are very good at it.’ The author recommended practising stone throwing as a deterrent. We took a few minutes to idly indulge in this, setting our aim at a pointy rock on the scree some 20 metres away. Safe to say we would have been torn to shreds if we had been required to rely on our skills. 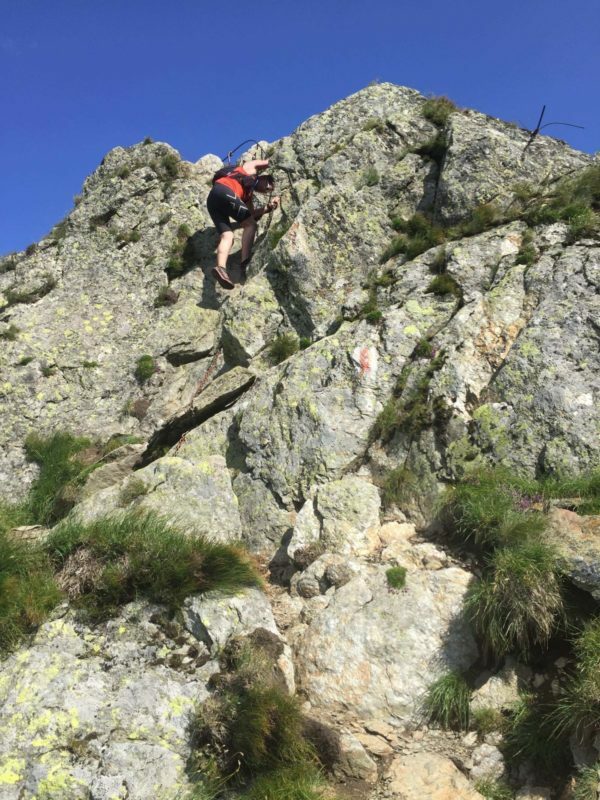 Back at Şaua Caprei we turned back eastwards for a one-kilometre climb along a lovely path that culminated in a scramble up a rocky step, before an exposed neck of the Buteanu ridge led on to the summit of Vârful Vânătoarea (2507m). At this point I felt exhilarated by the day’s exploration. I was left with some yearning to bag a few more peaks, and to search out some scrambles on the less trodden ridges. But it had been a satisfying day, and the clouds to the west were looking more ominous, so we beat it back to the cabana. 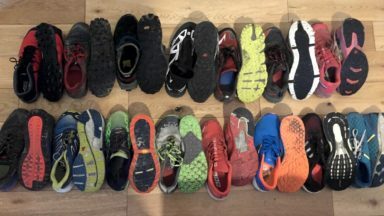 We returned down a steep rocky path marked with blue circles – a great opportunity for some scree running – before racing back at nearly full tilt over the final undulating kilometre. The following day saw the ridge shrouded in cloud once more, with a further forecast of heavy rain. Also Joe was suffering from gut-rot, which we attributed to a dodgy schnitzel in a roadside restaurant, so he was understandably reluctant to be too far from sanitation. 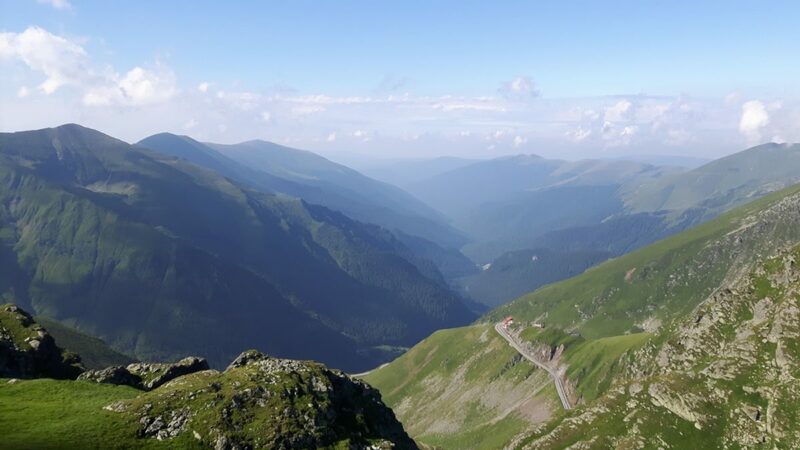 We therefore planned a day of touring, driving down the north side of the Transfăgăraşan (which was every bit as gratuitously curvaceous as the way we had ascended). We stopped off for a brief blast up a wooded path, evidently a popular tourist route, to a spectacular waterfall, the Cascada Bâlea. I felt pleased to be hitting a trail unexpectedly, though not without a tinge of longing for bigger things. As if to vindicate ourselves, on the descent Joe and I practised a technique that Kílian Jornet reportedly espouses, of taking a visual snapshot of the trail ahead up to a chosen point, and running to it with eyes closed. We were soon in the flat lands once more and driving east along the Făgăraş plain. The mighty ridge loomed on our right, part-hidden in purple-grey cloud. We thought about how exciting it would have been to walk in from here, as we had originally planned. It would have been a long, and more daunting, but altogether more adventurous approach. We had made good use of the Transfăgăraşan road, but almost bemoaned its intrusion into that untamed country. The settlements down here on the plain were linear, with storks’ nests atop telegraph poles, and the shuttered, painted facades of each house adjoined by large gates. These were similarly closed-off, suggesting an open yard beyond. Dogs had established an age-old right of way, and Joe would frequently swerve to avoid a slumbering canine straddling the white line. We headed for Bran, home to the fortress on which Bram Stoker based Castle Dracula. Bran turned out to be a bustling tourist centre, and a tour of the castle was worthwhile. Pleasingly the exhibits focussed on the castle’s history as a medieval stronghold, and latterly as a home for members of the Romanian monarchy, with a suitably small section devoted to its entirely fictional appropriation as the home for Stoker’s count. There was everything an eight-year old boy would expect from a castle – thick-walled chambers linked by intricate passageways, plenty of brutal weapons on display, and the odd bearskin rug. After dining in a restaurant terrace we returned to the car. 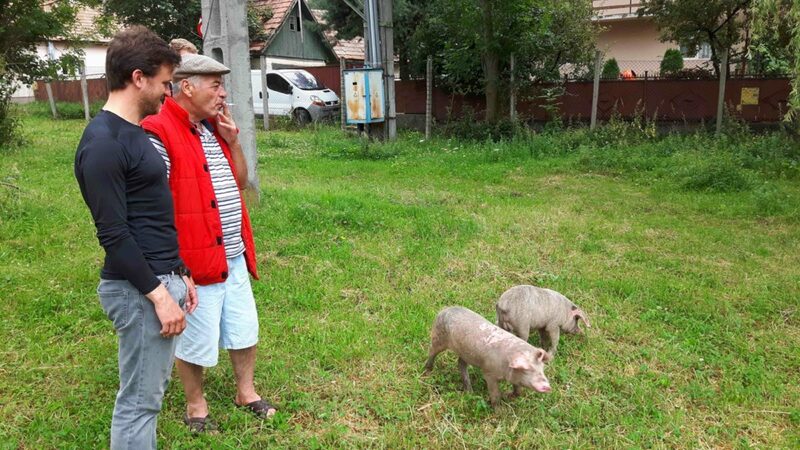 The car park, which was in fact a field, was home to two little pigs, which were trying to make a run for it as we arrived, pursued by the custodian, who managed to coax them back by calling them by name. We must have showed a bit of interest in the pigs, because the custodian gestured for us to come with him around the back of a derelict house, where he had a smallholding. A young bull was chained to an oak tree, the pigs had joined us, and two black sheep nestled under the back wall of the house. Our new friend spoke to us at length in Romanian, despite our evident lack of understanding, and we could but nod and smile. A large dog, of the kind described by Roberts, came surging towards us. It was thankfully chained, and to show that it was friendly the custodian lifted it up by the armpits and gave it a kiss on the nose. There was clearly nothing to fear from this man, but we were making to politely reclaim our car, when he promptly led Joe by the arm, with me alongside, and pointed reverently at a faded portrait of Ceauşescu affixed to the gable end of a barn. It was a strange moment. Was this a history lesson or a homage? It seemed our man didn’t think too badly of the eccentrically sadistic tyrant. 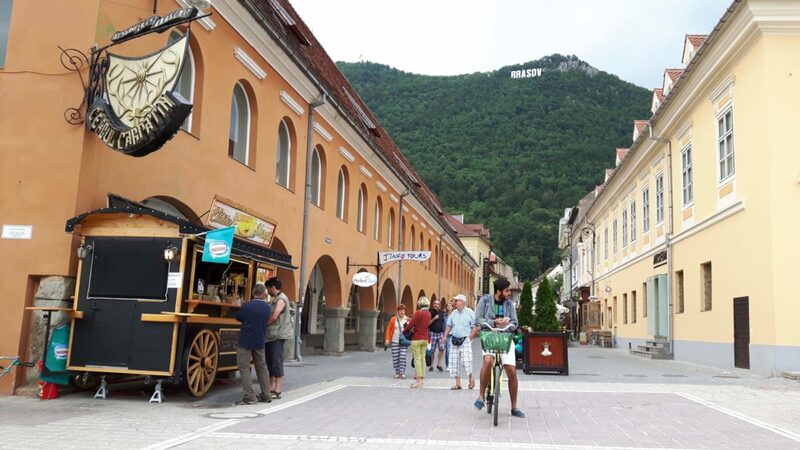 We spent the final night of the journey in relative luxury in Braşov, a beautiful medieval town at the eastern foot of the Făgăraş range with a cosmopolitan feel. We were to fly back on the following afternoon. 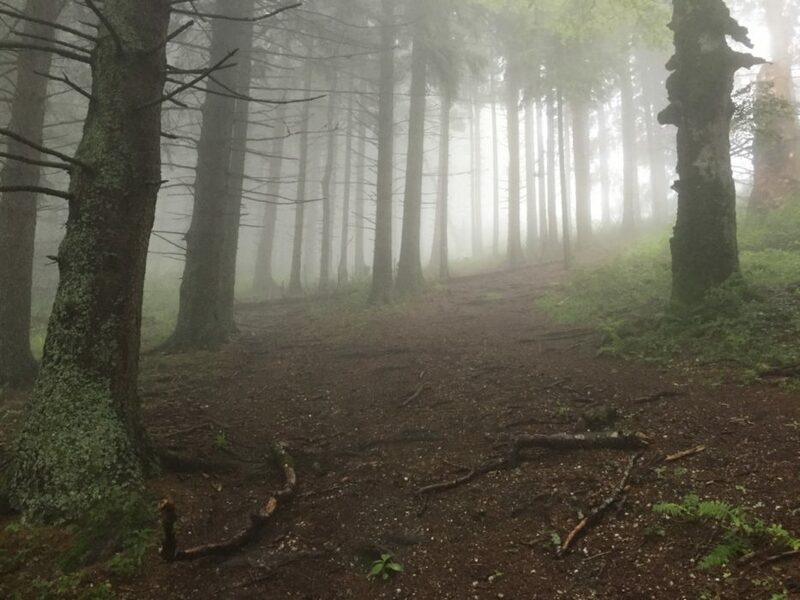 However, a day of touristic rambling and driving had left us with a thirst for more mountains, so despite a terrible forecast, we decided to do a route in the forest the following morning, come what may. With this in mind the evenings’ conversation turned to the Carpathians’ 8000-strong population of Ursus arctos (brown bears). A YouTube video of bears in nearby Sinaia made their presence and proximity seem all the more real, and we discussed the usual mythology about what to do in the event of a close encounter with one of these beasts. The next morning we set out at seven and parked up in a layby near the edge of the forest just north of Timişu de Sus. We ran at a steady pace up a wide forestry track, with the looming trees on either side reminiscent of the nave of a great cathedral. 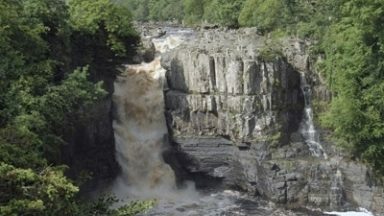 I had fixed my keys to a loop on the strap of my rucksack, so that they jangled as I ran, as an early warning to the bears. On steeper sections, where the pace slowed to a walk, we instead conversed more continuously than usual, in loud voices, breaking into the occasional verse of ‘If you go down in the woods today…’ A narrow path turned off and climbed steeply through the trees, cutting off the corners of the main track as it wound upwards towards the Piatra Mare. The woods were a dense mixture of broadleaved and coniferous trees and at this early hour, on a dull day, there was near darkness. We saw no one on this route. At times the trees opened out a little, and a thin mist hung among the trunks. There was a distinctly timeless, almost mythical, feel to the forest. Further up, climbing at a steady pace, we passed a refuge building. The path carried on on upwards through dense scrub, a mixture of beech and dwarf pines. Here the talk inevitably turned to Ursus arctos again, and we found ourselves studying the muddy path, where bear-like imprints seemed to spring out all over the place – Joe and I spotted a skid mark of four or five parallel lines – could this be the work of the huge, almost hoof-like claws we had examined on the bearskins hung in the cabana at Bâlea? Aidan, who has spent some time in Alaska observing grizzlies, was altogether calmer and downplayed our chances of becoming breakfast. The path eventually emerged from the primeval forest and we continued for some way through rain-soaked grassland, past some cattle, which emerged like apparitions from the fog. With an eye on time, and planes to catch, we turned tail at a marker post and after bounding back through the grass, managed to find the entrance to the forest again. The descent was phenomenal. All thoughts of bears soon evaporated and we flew down the steep forest path, sidestepping gullies in the mud and hotfooting over tree roots. Lower down, where smooth North American style trails plummeted down the hillside, and our footfalls were cushioned with pine needles, we raced to each intersection with the forestry road. Elated, we regained the track for the final mile or two, and ran in together. The mountains of Romania had really struck a chord, and we vowed to return, with better weather, for a more substantive trek.